This article continues on from Part 5 - Improving the Debugger and More Keyboard Work. The cause of the "Option Not Fitted" error was pretty obvious - In part 2 I noticed a couple of calls into TRS80 BASIC to print characters to the console (0x0033) and to scan the keyboard for input (00x2B) - two functions that I hadn't got around to replacing yet. 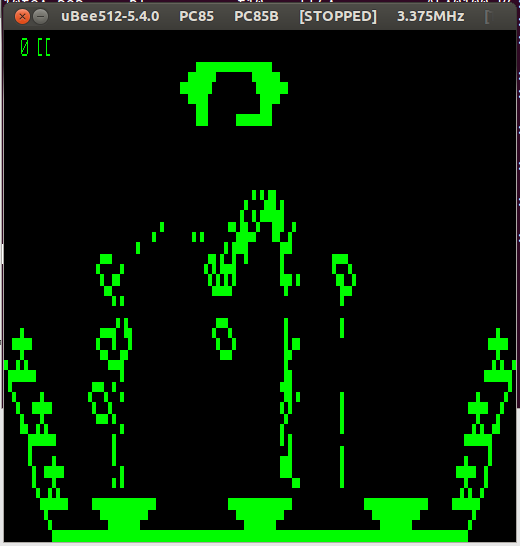 Because the TRS80 BASIC accepts the cursor location as an actual address in video memory, whereas the Microbee expects it as an offset from the start of the screen buffer, I needed to adjust it - hence the saving of HL to the stack and masking off the top 4 bits. In order to track this one down, I used the same techniques as previously described - that is memory write breakpoints to locate the code writing the corrupted score to the screen and quickly tracked down this code, with one of my left over comments about a value that I couldn't determine was either an address or a value. LD      HL,3780h        ; address or value? After adding HL and DE I was left with a value pointing to some random location in the middle of the code - hence the corrupted display. Obviously the value 0x3780 was some sort of offset between the screen buffer and a buffer holding the highest score message. I knew it wasn't the high score table directly since I new where it was and it was in a different format to how it was presented on screen. Which found it in two locations. I new 0x3800 was the high score table. What's at 0x3972? 3972: 62 72 61 64 80 80 80 80 80 36 37 30 80 80 80 80 "brad.....670...."
3982: 80 80 80 80 80 80 80 80 80 80 80 80 80 80 80 80 "................"
That's it. Looking back at my memory map revealed that address to be in one of the off-screen video buffers. Because the final value is negative the +0x10000 is to wrap it back around to a positive value so the assembler doesn't generate a warning. I also searched through the rest of the code for 0x3780 and found one other place where it was used - so took a punt and updated that one too. I'd hadn't got around to fixing this yet, so though I'd tackle it next, only to realize it was already fixed. That second reference to 0x3780 was the culprit. Another small issue I had noticed was that I was unable to start the game from the instructions screen. It should have been simple to find, but I set breakpoints on all the places where there had been references to the TRS80's keyboard and no breakpoints were getting hit. Odd. Self modifying code! In other words it was updating the target address of a couple of CALL instructions and YAZD couldn't determine that the bytes at that address were code and not data. The game was now fully functional! All that was left was sound and slowing it down to compensate for the Microbee's faster clock speed. 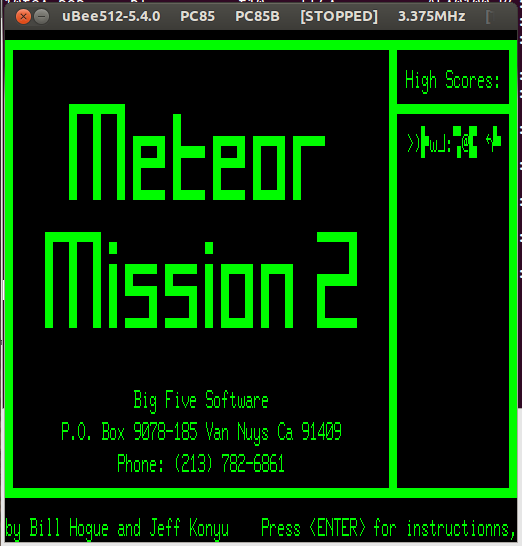 Porting Meteor Mission II to Microbee continues with Part 7 - Finishing Touches.